Bajaj Pulsar 200 DTSi was introduced in the market around 9 months back and it enthralled the Bajaj dealers by raking sales as well as the Indian bike enthusiasts. The bike has a 200cc engine and oil cooler, which is a self-adjustable one- it adjusts the viscosity of the lubricant oil so the overall performance of the bike is enhanced. The shock absorbing quality is enhanced by a large 33mm front fork. 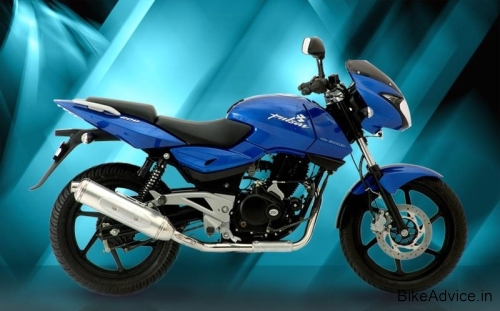 Pulsar 200 bike has other wooing features such as a stylish petrol tank flap along with an anti-scratch tank pad, ExausTEC technology in the silencer that maintains engine torque, comparatively light weight of the bike, the split seat with better seating space and excellent performance. Looks: Bajaj Pulsar 200 DTSi is available in eye candy black, red and blue colors and looks deceive you like you got an international sports bike in front of you! The bike has aerodynamically designed petrol tank with tank flaps and beefy front. The bike has great indicator features such as choked air filter indicator, high oil temperature indicator, a low battery voltage indicator and a low engine level indicator…huh! A big long list right? The sporty looks coupled with greater chassis rear inclination gives this variant of Bajaj Pulsar DTSi second glances be it in a parking lot or on roads! The bike has usual LED tail and brake lights and the main headlamps and parking lamps emit white light with blue-tinged bulbs instead of the yellow light of incandescent bulbs. These are certainly an improved stuff and more friendly to eyes! Performance: Bajaj Pulsar 200 has a split seat architecture that provides better style and comfort for both rider and pilion. The bike has 200cc powerful engine and the telescopic fork provides better control. The display panel can detect failure in components. Both front and rear wheels have tubeless tyres that are first in the motorcycle market and the wheelbase is 1350mm. The triple rate spring NitroX shockers provide cushion feel and telescopic fork suspension. The torque of the bike has been improved by ExhausTEC technology and the bike also has an improved clutch system. The gear can be changed easily and it is capable of taking more loads. The presence of oil cooler enhances the engine performance. The engine has a maximum power of 18ps and you will get an average of 40 km per liter of petrol. The fuel tank has a capacity of 15 liters and has a capacity to store 2 liters of reserve petrol. The oil cooler improves the performance of the engine at high speeds without overheating. Bajaj two wheelers, especially the battery, need low maintenance. Under test condition the fuel efficiency is 50kms/ltr. Final Verdict: The 18ps pulsating power generated by the 200cc engine provides great riding excitement to bikers, echo all of the Bajaj dealers . It is the first bike in India with tubeless tyres both in front and rear in this segment. The tubeless tyres offer superior stability that is safer than the conventional tube tyres while adding to fuel economy. Better road grip and stability is ensured by the very broad rear tyre. The bike has new digital console with Digital Odometer, Digital Speedo meter, Digital Fuel Gauge and two Digital Trio Meters. This Bajaj bike is the first one with electric start. And needless to say it is very convenient for a city rider. After all, we know the traffic jams right? Ask me downside of this bike… Well, it doesn’t have a kick-start facility. So when the battery is down (keep looking at the indicator off and on my friend!) or fused out, God save you or you got to push it to a recharge facility!